According to the 2011 Community Pulse Report for Cuyahoga County released by the Center for Marketing and Opinion Research (CMOR), the non-profit or charitable organization that makes the BIGGEST difference in Cuyahoga County according to Cuyahoga County residents, was the Salvation Army, with 14.7% of the respondents to the 2011 Cuyahoga County Collaborative Poll naming this organization first. Slightly fewer, 12.5%, named United Way of Cuyahoga County. Rounding out the top 5 most commonly named organizations was Local Food Banks (11.4%), American Red Cross (7.9%), and Catholic Charities (6.7%). When looking at the types of organizations most frequently named by Cuyahoga County residents, nearly one-in-three, or 29.7%, named a basic needs or self-sufficiency organization. 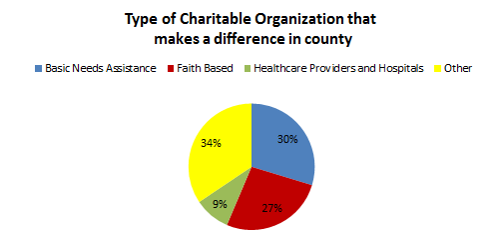 The second most common type of organization was faith based organizations, with 26.7% naming one of these agencies. Other types of organizations named include, in order of importance, healthcare providers and hospitals (9.2%), emergency and disaster assistance (7.9%), foundations (4.0%), health condition and diagnosis related (3.2%), veteran organizations (1.5%), youth and family organizations (1.1%), animal related organizations (0.5%), Cuyahoga County Public Agencies (0.4%), neighborhood revitalization programs (0.3%), and pregnancy organizations (0.3%). The Community Pulse Reports were developed to assist community leaders in monitoring the quality of life in the county as well as to identify community needs. Each year, the Community Pulse Report focuses on a unique area of community well-being while maintaining a standard set of community needs and quality of life questions annually. In 2011, the focus area was non-profits and charitable organizations that make a difference in the community. The data from the Community Pulse Report comes from our Collaborative Poll program. The Collaborative Poll program is a research service offered to organizations, agencies and businesses with a county-wide interest as an affordable method of collecting information on opinions & attitudes of county residents. A Collaborative Poll is an annual telephone survey that includes questions posed by multiple organizations in which each participant pays for only those questions necessary to meet their information and research needs. The Center for Marketing & Opinion Research is a full service public opinion research firm located in the Portage Lakes area providing innovative research solutions to non-profits, government agencies, social service organizations, colleges and universities, and hospitals. CMOR utilizes multiple modes of data collection including telephone, web and mail surveys and focus group administration as well as offering comprehensive consulting services including consultation on research and survey design, program evaluation, grant writing, data management, analysis and report writing. For more information on the Community Pulse Reports, please contact Amanda Barna at the Center for Marketing and Opinion Research (CMOR) at 330-564-4211 or email at abarna@cmoresearch.com to speak with a member of our research team.